The name Sinkovec stands for more than 3 decades of laundry tradition. The modern laundry with the state-of-the-art machines as well as a highly motivated group of 90 employees enable top results at competitive prices. 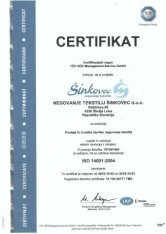 Sinkovec group ensures accordance with the highest environmental and quality certificates. 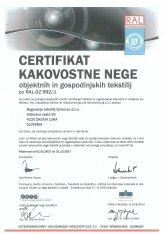 As such we hold the following certificates: ISO, RAL I,II,II. We also have the strategic plan of continuous uninterrupted service.